From an outsiders’ perspective, the Salina South Cougars’ start to the season was difficult to figure. They opened with a 41-35 win against Class 6A’s top-ranked Derby and then proceeded to drop consecutive games to Maize and Blue Valley. Since then, Salina South (10-2) is on a nine-game winning streak and enters the Class 5A state championship with a rematch against the Blue Valley Tigers (9-3). Kickoff is at 1 p.m. Saturday at Emporia State University’s Welch Stadium. The Cougars fell 40-28 at Maize and 35-28 at home against Blue Valley. Over the Cougars’ next seven games, they scored at least 40 points in each outing. Senior quarterback Justin Stonebraker has helped take the Salina South offense to new heights, passing for 1,683 yards and 22 touchdowns. He’s completed 95 of 161 passes and has thrown only four interceptions. Salina South senior running back Mike Jones leads the rushing attack with 1,797 yards and 31 touchdowns. Stonebreaker has rushed for 834 yards and eight touchdowns. Stonebreaker’s top receiving target is senior Zach Nachbar, who enters with 47 catches for 1,114 yards and 16 touchdowns. Defensively, Cade Calvert and Richard Walters lead the Cougars with 101 and 97 tackles, respectively. Blue Valley was only 3-2 after the first five games as the Tigers fell to Bishop Miege and Blue Valley West. Blue Valley fell 18-17 to Blue Valley West in the first meeting, but bounced back to beat the Jaguars 38-33 during last week’s semifinal game. Logan Brettell leads Blue Valley under center. Brettell has completed 127 of 222 passes for 1,598 yards and 19 touchdowns with only four interceptions. Chance Nelson leads the Tigers in rushing with 1,628 yards and 18 touchdowns on 236 carries. Montana Brady has rushed for 768 yards, and Brettell has rushed for 655 yards. Blue Valley’s top receiver has been Mikey Henson with 46 catches for 625 yards and 10 touchdowns. Henry McGrew leads the Tiger defense with 143 tackles. Joe Forlenza and Dylan Smith also have more than 100 tackles on the season. 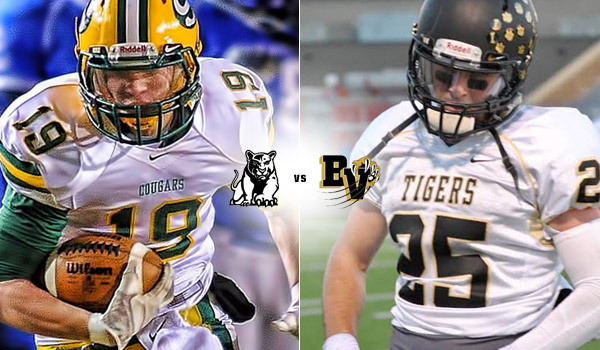 Now, the Tigers must try to beat a solid Salina South team twice in the same season.